Here is your regular reminder that the residents of Flint, Mich., have not had clean water for just over three years. Unfortunately, they are still expected to pay water bills for water that is neither drinkable nor usable, and on the heels of last month’s shut-offs for nonpayment of said water bills, this month, residents are being threatened with the loss of their homes. More than 8,000 residents who have unpaid bills have received notices that if their balances are not paid by May 19, a tax lien will be placed on their homes, according to a report by NBC News. Melissa Mays, a mother and activist who lives in Flint, received a notice in the mail Friday that states that if she doesn’t pay nearly $900 by May 19, a lien will be placed on her property. “I got scared, probably for the first time since this all started; this actually scared me,” Mays told NBC. Those who received the notices have water bills that have not been paid for six months or more. For those who do not pay by the deadline, a lengthy process begins that could end in foreclosure. Mays told NBC that she plans to go against what she believes and pay up so she can keep her family’s home. “While I understand this is the way the law reads, we are in a totally different situation,” Mays said. According to NBC, city leaders say they are in a bind and need the cash. 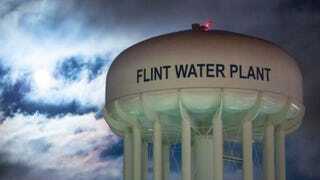 “We have to have revenue coming in, so we can’t give people ... water at the tap and not get revenue coming in to pay those bills,” Al Mooney, of Flint’s treasury department, told NBC. Mooney said last month’s shut-offs were already working in the city’s favor, with nearly $3 million brought in. In the previous month, the city collected only $2.1 million. Mooney said that he hopes the tax-lien notices will prompt people to pay their water bills because that could bring in nearly $6 million for the city. Flint families should not have to pay for water that they still cannot drink, and they certainly should not lose their homes over this ongoing water crisis that was caused by the callous decisions of state government. It is unfortunate that Gov. Snyder ended water credits for Flint families. I opposed this decision because Flint families deserve support from the state until there is confidence in the water system again.